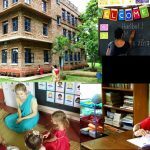 The Uttisthata Jagrata Chatra Samaj is a Spiritual Academy for Formation and Education (SAFE). This is a preaching effort specifically aimed at students from schools and colleges. 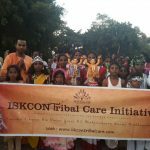 Their goal is to improve the quality of students within society at large in order to promote the long-term well being of Srila Prabhupada’s movement and its members. A team of eleven devotees goes to different schools and colleges in Nadia, Barddhaman, Murshidabad and Midnapore Districts of West Bengal and holds an introductory seminar where students are introduced to Krishna consciousness. The students who are inspired and interested to learn more then form a Jagrata Chatra Samaj group (JCS). Each group consists of 15 to 25 students. There are currently over 60 groups and roughly 1,000 students who regularly attend the weekly JCS meetings. 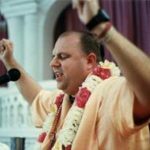 Approximately 180 of the students have become devotees, and out of those who took to Krishna consciousness, about 36 students have joined as full-time ISKCON brahmacaris. Each Jagrata Chatra Samaj student group meets for one and a half hours weekly in their school, college or in a student’s house. 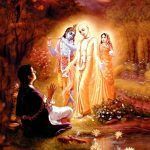 The meetings begin with chanting one round of the maha-mantra, followed by chanting the mangalacarana (invocation) prayers and the recitation of one verse from the Bhagavad-gita As It Is. 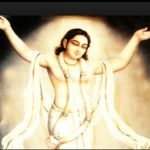 They then refer to the Jagrata Chetana textbooks, which contain 100 basic spiritual questions and answers, and a guidebook named Jiboner Prastuti which has been published specifically for them, and are given a task for the following week thereafter. They also discuss topics related to ISKCON and Srila Prabhupada and after their discussions, the students speak about their realizations. They wrap up the meeting with one more round of japa and prasadam. This year, the Uttisthata Jagrata Chatra Samaj has just held their 24th Annual Student Conference in Sridham Mayapur for two days. The program was inaugurated by Bhakti Purusottama Swami, Pankajanghri Dasa and Subhekshana Dasa in the Sri Mayapur Chandrodaya Mandir, and 1,000 students from all around West Bengal came to participate. They attended a japa workshop and classes and seminars given by Bhakti Purusottama Swami, Premanjana Dasa, Venudhari Dasa and Ananda Bardhan Dasa. The students participated in various spiritual contests such as sloka recitation and quizzes, and performed dramas, seminars and gave lectures. There was also an ecstatic Hari nama from the ISKCON Mayapur campus to Yogapith, the birthplace of Lord Chaitanya. Selected students who participate in the annual conferences are engaged in preaching to the local people and volunteering in different festivals in their temples. They also organize seminars, pandal programs, parikramas, classes, dramas and video shows all around their district.